From major cities to sleepy towns across the country, sushi is gaining momentum in the restaurant world and there are many Sushi Restaurants on the Outer Banks. There is no exception when it comes to this Japanese favorite. It may be the beach, but when it comes to sushi, a handful of chefs at Sushi Restaurants on the Outer Banks offer some of the most mouthwatering variations of this popular menu item. Here’s a rundown of some of the best spots on the beach to satisfy that sushi craving. While they all serve the traditional favorites, each brings its unique flair to the world of sushi. Sunset Grille & Raw Bar’s sushi bar in Duck opens daily at 4 p.m. and offers a menu of more than 20 variations of sushi. Enjoy their famous Spider Roll stuffed with local soft shell crab meat, the Dynamite Roll with blackened tuna and a spicy chili base or the Offshore Roll overflowing with tempura and coconut shrimp, cream crease, avocado, spicy mayonnaise, and eel sauce. These are just a few delicious rolls they offer. In Kitty Hawk, Sanya Sushi Bistro has a complete sushi bar and offers sushi appetizers and entrees. Open for lunch and dinner, start with White Tuna Tataki or Seafood Carpaccio for starters and move on to their famous sushi entrees such as the Tuna and Salmon Deluxe, the Fancy Maki Combo or the Love Boat, which comes with 15 pieces of sashimi and 12 pieces of sushi with a rainbow roll. Watch us make sushi. Don’t miss Fuji Japanese Steakhouse and Sushi Bar in Kill Devil Hills for lunch or dinner. Fuji specializes in sushi and offer great lunch specials. From the Fuji Roll – featuring smoked salmon, yellowtail, cream cheese, avocado, and scallions – and the Spicy Beach Roll for starters, to the Atlantic Ocean Roll, Blackjack Roll and more, there’s something for every sushi lover at Fuji. Miller’s Seafood and Steakhouse, also in Kill Devil Hills, serves sushi daily beginning at 4 p.m. You’ll love the OBX Roller filled with tempura fried crispy shrimp, spicy tuna, mango, scallion, message, topped with avocado & crab and served with eel sauce and spicy mayo. Or try the delicious Miller’s Roll, featuring tempura fried crispy lobster tail, asparagus, scallion, crispy onion strings and more. These are just a few of the favorites you can choose off of Miller’s sushi menu. In action, rolling sushi. To the south, in Nags Head in the Outer Banks Mall, you’ll find Taiko Japanese Restaurant. Customers delight in the special roll offering such as the Nags Head Roll, filled with white fish, eel, shrimp, tamago, avocado, cream cheese, crabsticks and lightly fried. Other specialties include the OBX Roll, the Pirate Roll, and the Sunrise Roll. Open for lunch and dinner, Taiko is closed on Sundays. And if you are lucky enough to be on the Outer Banks in the off-season, check out sushi night at Tortugas’ Lie beginning every Wednesday at 5:30 p.m. From sashimi to fingers, combos, and rolls, it’s the place to be mid-week for sushi lovers. Don’t miss the Tortuga Roll, filled with mouthwatering tuna, crispy wonton, chili, aoli and masago. Or check out Tortugas’ other specialties include the Hatteras Roll, the Fried Oyster Roll, and the Rasta Roll. Wash it all down with a Japanese sake or beer. But wherever you end up on your quest for this popular Japanese delicacy, you are sure to discover that Outer Banks Sushi Restaurants are rolling out some of the best sushi the East Coast has to offer. 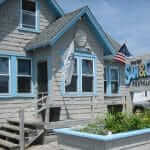 Anytime you are hungry on the Outer Banks, click into the Outer Banks Restaurant Guide.